Hanks Siding specializes in Vinyl Siding, Windows, Shutters, Porch Columns, Rails and more. Hank’s Siding Company was founded by Hank Phillips. He has spent many years learning the secrets and skills needed to succeed. During that time, we have established a tradition of Quality Work, Affordable Pricing and Rapid Service. We take great care to work individually with each of our clients to make sure our service exactly matches what you are looking for. With Hank’s Siding you will receive the best possible Siding and Window service. That’s because we understand Siding & Windows thoroughly and our employees can quickly resolve any challenges you may face. We believe strongly in getting the job done right the first time. Featuring Superior vinyl windows with Energy Star Rating and factory Lifetime Warranty, available in Single or Double Hung. 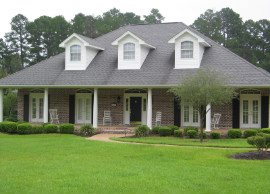 We can handle every aspect of your project, from Vinyl Siding, Windows, Shutters, Porch Columns, rails and much more.